This could be the best non-fiction book I’ve ever read. I bought this book because I had previously bought and enjoyed History’s Greatest Deceptions and Confidence Scams. That book wasn’t perfect, but it was good enough that I wanted to see what they’d written next. And I am so glad I did. Where Are They? shows what happens when writers gain confidence in what they are doing. This book soars to the heights – both in its subject matter and literally, as a masterpiece in conveying information. The title comes from physicist Enrico Fermi who said, about theories that Earth should already have received extraterrestrial visitors and yet no convincing evidence of a visit existed, “Where is everybody?” The universe should be teeming with civilisations at one level of development or another – so where are they? The book examines all the current theories that have been developed to answer this question. It takes no sides. It simply sets out the present state of knowledge. But it does so in the most brilliant, beautiful prose. 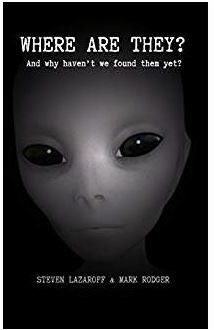 So brilliant that I would recommend this book even to readers with no interest in the search for alien intelligence, simply because they will enjoy the limpid prose and the humour with which the arguments are presented. Not a single prominent theory about the evolution of life forms has been left out. It’s also clear that the authors take a dim (they would probably say “realistic”) view of humanity’s fitness to receive visitors from another civilisation. I’ll say it again: this could be the best non-fiction book I’ve ever read. Do yourself the most amazing favour and READ IT. Very kind of you John. Here is a complete unbiased and unsolicited review we were surprised and caught off guard with. I thought you’d enjoy. An excellent review, Steve. I agree completely with the praise for the balance between providing too much technical detail and skimming the surface too lightly.